NAIROBI, Aug 2 2010 (IPS) - In a tiny village near Kisumu city in Kenya, scientific researcher Mary Anyango Oyunga spends most of her time educating women about something they have always done – grow sweet potatoes. But Oyunga’s message to the female farmers in Kisian village is new, even though it is based on her scientific research findings published in 2009 in the refereed African Journal of Food, Agriculture, Nutrition and Development. The research, which revealed that Orange Fleshed Sweet Potatoes (OFSP) were extremely rich in vitamin A, may have been in the scientific domain for a while but until recently the women in Kisian knew nothing about it. And how to go about doing this is one of the skills she acquired after winning a fellowship with the African Women in Agriculture Research and Development (AWARD)programme. The programme brings together African female agricultural research scientists based on intellectual merit from 20 different agricultural science disciplines. “Scientists are on the cutting edge of solving Africa’s food crisis. But we need to urgently address the gender gap in our scientific community. We need more women pursuing careers in agricultural science. Because women are the face of African farming,” said Dr Akinwumi Adesina, the vice-president of Alliance for Green Revolution in Africa. Oyunga is just one of the 180 top ranking female agricultural research scientists who have been awarded fellowships under the AWARD programme, and who is already putting into practice what she learnt. In Kisian it is considered a disgrace if a woman does not have some vines of sweet potatoes growing on her farm. The potatoes are highly treasured in this part of the world. They are grown all year round and supplement sometimes meagre diets. Oyunga, who works at the Kenya Agricultural Research Institute (KARI), is busy communicating her research findings to women smallholder farmers here. Particular types of sweet potatoes have an important nutritional value that is crucial especially to young children, she tells them. These findings could save some of the 43 million children under the age of five in sub-Saharan Africa who are at risk of Vitamin A Deficiency (VAD). According to the World Health Organisation, VAD is responsible for most cases of impaired blindness in children and significantly increases the risk of severe illness, and even death, from such common childhood infections as diarrhoeal disease and measles. In pregnant women VAD causes night blindness and may increase the risk of maternal mortality. 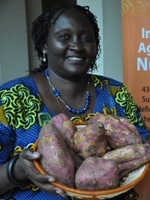 Through the Sweet Potato Action for Security and Health in Africa programme, Oyunga has received funding to assist popularising the OFSP varieties in the region. In a pilot project in Western Kenya, all pregnant women attending clinics in public health centres are issued with a voucher that allows them to go to designated potato seed growers in the region and receive 120 vines of OFSP. “If the method proves successful, then we will replicate it all over the sub-Saharan Africa region,” said Oyunga. “When your study is implemented especially to serve the rural poor, you feel like you’ve created a bridge that people are using to cross from the world of poverty to economic development. It is extremely satisfying,” Oyunga adds. A report released in June 2010 by ActionAid International shows that small holder farmers, majority of whom are women, are responsible for 90 percent of food grown in Africa and produce about a half of the world’s food supply. Yet the women scientists are rarely involved in scientific agricultural research or leadership positions in that field. Vickie Wilde, the director of the Gender and Diversity program at the Consultative Group on International Agricultural Research and founder of AWARD agrees it is time for change. “Investing in Africa’s women is a smart investment … Yet investing in Africa’s women scientists is the best bet,” said Wilde. AWARD was developed in 2008 to strengthen research and leadership skills of African women in agricultural science. It offers female researchers mostly from sub-Saharan Africa, though including West Africa, two-year fellowships focusing on mentoring partnerships. By sitting with highly experienced mentors, fellows acquire various skills like writing competitively in scientific journals, developing competitive proposals to fund implementation of their research findings, and working with poor communities during implementation. “The roadmap to ending poverty in Africa is based on empowering women, who play an important role in food production,” said Dr Ephraim Mukisira, the director of KARI. Aishatu Bashir Ardo, a Fulani Muslim from Northern Nigeria is another fellow who has broken traditional barriers by joining men to administer artificial insemination for cattle. She is the only woman in her region doing what has traditionally been stereotyped as a duty for men. And it seems as if the situation for women across the continent is slowly changing. According to a 2008 survey conducted over eight years across sub-Saharan Africa by AWARD in partnership with Agricultural Science and Technology Indicators, the number of African women professionals employed in agricultural sciences grew by eight percent during the study period, while the number of African men grew by two percent per year. Though the gap is narrowing, the research found that women still represent less than one quarter of Africa’s scientists holding positions in agricultural research, and that less than 14 percent of leadership positions are held by a woman. “Women have always played a central role not only in food production, but also ensuring that it is brought to the table. They therefore know what is good for society,” said Mukisira explaining why the numbers of women in agricultural research needed to increase.